How Perfect Forex Technical Analysis makes profit ? The foreign exchange market uses two different ways to predict the movement of prices and to make purchases that will ultimately allow traders to make a profit. One way is to use fundamental analysis. A second, more popular method is technical analysis. Free online charts and tools are becoming increasingly more available. This allows traders to look at previous trends with the hope that past trends will help establish the movement of prices in the future. Technical analysis ignores all external factors, including the social, political, and economic state when looking at prices. It is assumed that these factors have already impacted the current rate of exchange so it’s not necessary to analyze these independently. Despite the fact that dissimilar currency pairs are being monitored, technical analysis results in fewer inconsistencies. The stream of resources and the action of individuals participating in the market has the largest impact upon the change in currency values because of all of the investors who are taking part in currency trading. Technical analysis attempts to establish if a pair of currencies will maintain the trend of either increasing or decreasing, whether it might reverse direction, or whether it might travel sideways. It also can determine if a currency pair will remain in its high-low range. There are a variety of gauges used in technical analysis, including support and resistance levels. Technical Analysis also uses volatility based indicators, ranging indicators, an indication of moving averages and indications of volume. These can all be used in the Foreign Exchange Market to make a profit. 1. Moving average based indicators (also known as MACD) can be used to determine whether or not the value of currencies are trending. This indicator can be used in divergence trading. It also has a signal line which can be used to notify traders about the right time to purchase or get rid of a currency pair. 2. Volume determines the number of traders, those who are purchasing and selling currencies, who are taking part in the market. Volume is an important indicator because it uses the rule of supply and demand. Traders can monitor trends and know what positions to take by noticing whether there is a strong demand to increase the price of a currency. If there is, then they will notice the huge volume of participants in the market at that point. 3. Whether or not the price of a currency has been increased further than it should have been can be analyzed by using Bollinger bands. It also provides insight to a currency’s price target which allows traders to buy or sell depending upon their position according to that target price. 4. Traders use the Relative Strength Index to measure energy. It lets a trader know whether or not a currency has been oversold or overbought. And, if so, if a reversal is likely to occur. Forex trading is a great business nowadays and is capturing the world market very rapidly. Great profit margin and 24/7 working hours are the two great advantages of forex trading. There are also a lot of other advantages of forex trading. Daily we come across a lot of news and rumors about United States economic issues. Apart from that thousands of news is published in local and international papers on the world economic issues every day. Currency marketing is a backbone of any economy. This factor can boost up any economy over nights and can also crash the economic structure of a country within few hours. Most of the brokers around the world are offering eight major currencies to trade. All the eight currencies have over 17 derivatives. Out these, minimum 7 piece data is released on daily basis. Here are eight major currencies of the world that are most rapidly traded. The most expected derivatives of the above mentioned eight currencies are as follows. Secondly newspapers give a lot of information about following things which greatly affect forex trading. 9. Information about manufacture sector. All these aspects have great importance from trading point of view. Apart from this the level of significance also changes with time. For example if the major resolving issue is unemployment then you have to make a trade by keeping unemployment in mind as a major trading factor rather than interest rates or retail sales. 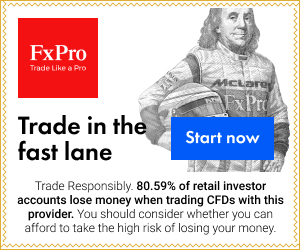 Simplifying all the above discussion you need to follow the trading trends and move according to these trends if you want to earn great income out of your forex trading business. Most of the traders trade news in a way that they wait for a consolidation period and then simply trade a breakout. This can be easily done in both short-term intraday as well as daily basis. As we all are familiar with the fact that economic news of United states as well as that of the world greatly affect currency market, especially in case of short-term movements of trades which are triggered by these economic news. If you want to earn great profit out of your forex trading business then you must have some understanding of the thing that which release is expected and at what time, which release can greatly affect the economic condition and what should be your trading strategy at that particular time. This strategy is “fade the initial move.”. 1) You wait afther news release. 2) You open 30 min chart and watch trading position on EUR/USD. Enjoy in this forex strategy ! This question “How to trade forex on economic news releases ? ” is very very common question. 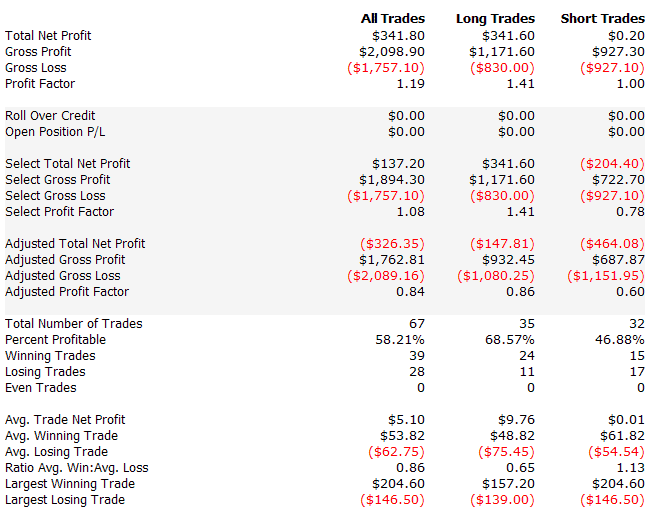 I read articles from Jamie Saettele on dailyfx.com.And he made great analysis Trading Nonfarm Payrolls? Here is an Alternative EUR/USD Strategy. This strategy is used for trendy markets. The major targets of this strategy are the trend reversal at the time of strongly trendy markets. This technique is also used for currency trading which shows very rapid reversal trends. The time frame mostly used in this technique is hourly based or 4 hour time frame. The accuracy of this technique increases in higher time frames although they don’t show rapid signal in it. There are following three indicators used in this technique. 3. Auto pivot point calculator to plot pivot points, resistance and support levels. If you want to understand this strategy you need to have a basic concept of intradacy candle. You must keep in mind that you have to go long if the intradacy candle cut out the lower Bollinger-band. You must place the market buy order during the opening time of next candle. The signals will reinforce in the situations when the market has a support level. You must keep in mind that you have to go short if the intradacy candle cut out the upper Bollinger-band. You must place the market sell order during the opening time of next candle. The signals will strengthen in the situations when the market has a support level. If you are dealing with long orders then the SL should 20 pips less than the minimum point of the longer candle and if it is short order the SL should be 20 pips above. The theory of Bollinger Band is intended to depict the instability of stock. It’s quite easy, being created of an easy moving average, as well as its lower and higher “bands”, which are two standard divergences away. The standard divergences are the statistical instrument used to include the maximum movement or else “deviation” across an average worth. Remember that at what time you use (BB) theory, it just works like a guide or gauge, as well as must be use with the other indicators. Usually, we apply the twenty days easy moving average as well as its typical deviations to make Bollinger Bands. The strategies that some investors apply contain short or else long term BBs (Bollinger Bands) on their requirements. The shorter-term BBs Strategies (below twenty days) are very sensitive to cost fluctuations, whereas the longer term BBs (above twenty days) are very conservative. The BBs theory won’t indicate precisely that point to purchase or vend a stock or option. It’s destined to be applied like a guide (or else band) by which to measure the stock’s instability. When the stock’s cost is very unstable, the BBs would be far separately. In the technical indicator graph, this is portraying as a widening space. Conversely, when there’s little cost fluctuation, hence less volatility, the BBs would be in the taut variety. This is portraying like narrow “lanes” beside the graph. Since for that how we apply the Bollinger Band (BB) theory, here’re some of guidelines. The history shows that the stock generally does not stay in the narrow trading variety for long, while may be measured using the BBs (Bollinger Bands). The strategies contain concerning the width by length of bands. Therefore, when the stock begins to deal within the narrow BBs, we identify that there’ll be a considerable cost fluctuation in near future. Nevertheless, we don’t know which way a stock will move, therefore the require to apply Bollinger Bands (BBs) strategies mutually with the other technical indicators. At what time the stock begins to turn out to be very unstable, it’s portray in the graph by the real stock cost staying or hugging very near to whichever the lower or higher BBs (Bollinger Bands), with Bands broadening substantially. The broader the Band is, the more unstable the cost is, and as well as the most likely, the cost will drop back towards moving average. At what time the real stock cost back off from Bands rear towards moving average, this may be taken like an indication that the cost trend has sluggish, as well as will turn to be back towards moving average. Nevertheless, it is ordinary for the cost to recoil the Bands the second time prior to the confirmed move towards moving average. Typically, as well as the BBs theory in exacting, it must be observed that the individual must not be applied at their own, however rather with the 1 or 2 extra indicators of various types, so as to confirm any indications and stop false alarms. In this article we made several tests using Forex System Builder free software. In order to grow or analyze our trading options and algorithms; our dealers often carry on experimentations; trials; optimizations; and so forth. One of our dealers tested an assortment of moving average-based trade schemes and we are at present sharing few of those conclusion. Richard Donchian made popular this scheme where the sales takes place when the five day moving average exceeds below the twenty day moving averages. R.C. Allen made popular this scheme where a sale takes place when the nine day moving averages exceeds below the eighteen day moving average. Few of the dealers are of the opinion that they are sacrwhenicing their gains they had achieved; when they employ a short-run long moving average. These individuals opt to sell off when the five day moving average exceeds below the ten day moving average. The dealers have utilized variants on these thoughts (some boasting the gains of one variant and others boasting the gains of the other). I have even heard of the seven day and thirteen day exponential moving average cross over from a friend of mine. As this system is greatly advised; it was let in to the trials for comparing reasons. The schemes covered in this special series of trials were as below and all implicated simple moving averages excluding where otherwise observed. Sell when the stock’s seven-day average exceeds below its fourteen-day average (exponential). We needed to keep off “curve-fitting.” i.e., we needed to test these schemes over a broad range of stocks constituting a variety of manufactures and market spheres. Also, we needed to test throughout a mixture of market terms. Hence, we tested the schemes on each of roughly 3000 stocks for nearly 9 years (or above the period on which the stock had merchandized if it has merchandized for below 9 years), factoring out commissions except the “slippage.” Slippage comes out if the sell order is 30 dollars, yet the price of the sale is done at 29.99 dollars. At this situation, slippage will be one penny per share. Similar “buy” scheme was time and again employed for each of the trials. The sole variable was the principle for selling. On each of the schemes, we summated the brings back on the entire stocks. We executed a sum of 47,312 trials. The thought behind this research was to determine which of these sell schemes obtained the best outcomes most alltime for most of the stocks. Keeping in mind that the earnings of a program that is used to just one share (even when this is replicated for 3K stocks as in our trial) does’nt colour the entire picture. Profitableness per unit of your energy and effort put in is a ideal way to evaluate techniques. In developing this analyze, we needed that each program had to delay for a novel buy signal in the particular share being examined. In the real world, a individual could leap to another share soon after a sale. Hence the individual will have no “dead time” when holding out to make the following buy. A program that is less successful when dealing just one share but that leaves a position previously could therefore produce greater income all over a year by empowering a individual to re- invest in an unlike security immediately after the sale of first one. But then, it would’nt be good entertainer if it takes time for the following buy signal on the same share while another reduced program was still positioning and earning money. The different sell techniques were organized with respect to their earnings. We place a table where the left side column was the shorter moving average and the middle side column was the lengthymoving average. The sell indicators were produced when the shorter average surpassed below the lengthy average. The right side column was the total earnings for all stocks examined. But, the chief item of evaluation was not the real value of profit for each sell program. This would differ significantly with unlike”buy” and “sell” program blends. We were not examining for the earnings of any complete program, but for the proportional advantage of the different “sell” techniques in solitude from their specific the best possible “buy” techniques. The aspects can be temporarily quoted as below. Any one of the techniques might be the most successful when dealing a particular share at a given period of time. But, this research has depicted to our fulfillment that promoting when the nine-day moving average surpassed under the eighteen-day moving average was usually not as successful as promoting when the ten-day moving average surpassed under the twenty-day moving average. Donchian’s five day moving average cross of the twenty-day average was also usually more successful than the nine-day average cross of the eighteen-day average. All assessments were similar. The only diverse was the collaboration of moving averages chosen for the selling program. This study can handle the view that a 3 moving average program using the five, ten, and twenty -day going earnings is proabably to be more successful than the identical four, nine and eighteen day moving average collaboration. It has the extra advantage of empowering a individual to observe the traversing of the five-day going regular with the twenty-day moving average. The second is Donchian’s program, and it’s a tough program in his own right. It as well gives previously indicators than either the nine, eighteen or the mix of ten-twenty or the ten -twenty, eventhough the ten-twenty collaboration tends to produce higher regular comes back. Therefore, such as the five,ten and twenty day moving average earnings on your data gives you an extra choice. You could use the five, ten and twenty-day multiple moving average program or you could also employ Donchian’s five, twenty-day combined moving average program. If the share design doesn’t appear or “feel” apt to you, the five day moving average cross provides you with an previously depart. Otherwise, you can delay for the ten twenty cross-over. Either will likely make more successful indication than the nine and eighteen – day collaboration. The decisiveness of which to utilize could be according to individual factors related to share behavior. Here, we disclose a trading strategy for manually day trading in Forex market. It utilizes RSI technical pointers and formation of engulfing candle stick. Trading the market of Forex can be profitable and easy, provided that if one knows what the trading opportunities to search for are. Forex trading market handles over $3 trillion worth transaction each day with several numbers like there are several opportunities to have, dealer only demands a good strategy of trading and discipline for following. Here, we will plan a simple yet effective RSI and the strategy of candle stick to day trade the opportunities of trading market manually. In the strategy we will utilize RSI indicator and the chart patterns. In spirit we are searching for the deals where the trading market has become over purchased or oversold. 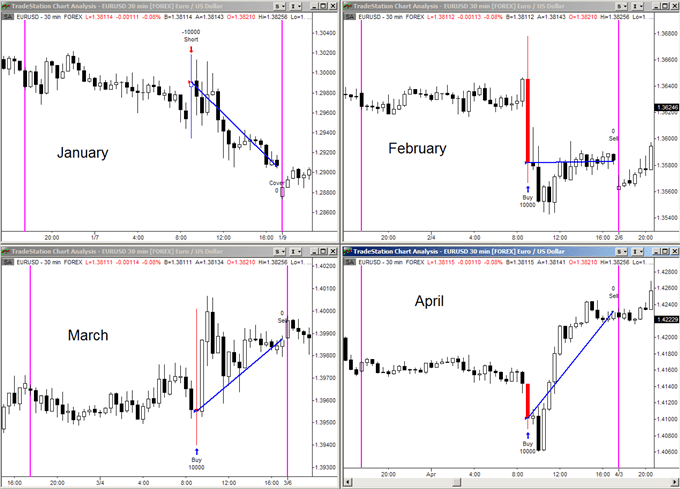 This chart given under displays four opportunities of trading. Notice that purchase and sell signals take place after a trading market has reached levels of over purchased and oversold on the indicator of RSI. The resulting signals of trade are engulfing the patterns of candlestick that shows a decisive setback of an earlier movement of cost. These types of patterns don’t take place often, but if one is patient and lucky, you should have the ability to find one each day on any one of the significant pairs of currency. In case you think when the perfect time for the chart pattern is, generally they are seen after the economic news release or at the time when important markets are opened. The best strategies of trading are simple that utilize two or more than two indicators for verifying the setups of trading. While no strategy of trading is 100% correct, if you utilize proper management of money, you can come on the top portion, even if one experiences a loose streak. A general discussion on the management of money is under the scope of the article, but if one does not risk over two per cent of the balance of account at any point of time, you need to do well. You can utilize other indicators for enhancing quality of trade signals one is achieving. Please one should not enter the trade each time one sees these patterns. You should also utilize other pointers for determining whether a deal is going to fail as the movement of cost has come on an important resistance or support level. In such a case, if one feels the deal is right, take it. Gut feelings is regarded as the best indicators one will have. Another technical pointer that can be utilized for identifying an important resistance and support levels is the pivotal points. As an effect, this technical pointer can assist you in identifying proper opportunities of trading. We are not going to discuss how pivot points are used, but can definitely have a glance at the resource on the pivotal point strategies of trading. You might find that a moving average can be really useful in finding the trend of the market and levels of resistance and support. A trade is established as a high possibility of success when over one indicator easily confirms the setup of trading. However, one must be cautious about not to utilize large number of pointers at a single time as they might cause one to guess a proper strategy of trading. As one becomes comfortable with dealing, one will want to note the advanced concepts and strategies of trading, like impact of carry trade on cost movements and how the monetary policy of Central Bank can have an effect on the trading market, but for this moment, a simple strategy of trading to handle the day trading manually should be offering you sufficient opportunities of trading to keep the account of trading growing. When you find a currency pair which has been moving within a defined support and resistance level, for a long time, it is called ‘Range trading’. Once you have identified the setup, then trade plan to purchase at support & sell at resistance, until the range stays intact. Here I take one hour chart of currency pair NZDCAD for looking range. In this scenario, when you see the price is trading at support, then you should take the long time positions with a stop below the low wick in the ranges. You would set a limit (profit) at the range’ top and let your trade play out. Now, if your trade goes as per your plan and price of the trade goes to the limit level, you would get a 40 pips’ profit. against it, if the trade price retraces & takes the step, you would suffer a loss of 8 to 10 pips. Let’s examine a few changes on the same trade. Here you will take the same above mentioned set up for trade, but you will increase the probability of taking gain by moving your limit down, a little bit close to your entry. You will notice that price hit the range ‘top four times, whereas, the price touched your fresh take profit level 15 times total. In this situation you give up some part of profit, in case the currency pair trades to the range’s top.However you can increase your chances of hitting limit and achieving the solid profit.You may have a chance to gain more pips but, along with a low likelihood of success or have a chance to gain a few pips less but along with a great probability of success. Let’s take two positions with same setup. In this case, I recommend you to trade multiple lot, because it allows you more flexibility in your trade management. But keep in mind, that any time you increase your position size; you also increase your risk. For instance, if you set up your trade stop at 10 pips, then, with one lot you are having risk for 10 pips, with two lots, 20 pips & so on. But be sure, your account size is able to handle the risk. You can apply the same strategy with 2, 6 or ten lots. If the trade gets a pre-determined profitability’ level this flexibility allows you close one of your positions, if you close one position, you lock in the profit. Moreover, the stop could be moved to manage the trade at an entry level price. If, the 2nd position retraces and manages to hit your stop you are closed of that second position with no profit, but the loss is also not incur, because you have 20 pips from your first position lock. If price continues to move toward the range ‘ top the second position will be closed after gaining the full pips into range. In this example it will be 40 pips. The net gain would be 20+ 40 =60 pips. Boris of the BJF trading offered an experimental copy of a skilled advisor that they called as Multi Currency Neuralscapling expert. I had spent nearly two months on testing the product on two various traders and results were not good as it used to be during the initial stage. The evidence of this skilled consultantis it repeatedly takes small variations into the account and use this particular information. The skilled advisor will consider several time frames for currency and other types of data and also try to take part in the movement of the market. This specific product definitely needs MetaTraderas it is a skilled advisor. It does dealing itself once it is set, but is technical. When one buys the product you will attain detailed instructions.They are generally not complicated, but you should be comfortable in navigating around the computer. This skilled advisor can be utilized with a MetaTraderdealer, but the makers also have their personal favorites. They suggest that the itemworks in the best manner on traders who have ultra-tights spreads. The first test that I conducted was with FXDD for the only reason thatI have a demo account of FXDD. I was suggested that I can attain better results with other brokers, but I declined to alter the traders and installed EA into the MetaTrader of FXDD. After a hurry of trading on the initial days, the particular system seemed to begin trading rarely. Sometimes, several days passed on without trading. I thought this was because of a spread limitation in that specific program. I was earlier concerned as the system instantly took ten percent loss on the initial deal. It was regarded as the first among the two ten percent losses. Though, between the losses the system would take advantage of the backup of account balance. The final consequence of one month of dealing with FXDD account was a profit of 3.91 percent. The initial account balance of demo account was four thousand eight hundred and eleven dollars and the finishing balance was around four thousand nine hundred and ninety nine dollars. Although not very remarkable results but keep in mind that this particular trading system handled everything itself. I was not happy with the effects. The cost of the item was high and I thought the results should be based on it. I consulted with the makers of EA regarding the consequences and they informed me that I can try again by utilizing FXCM for better effects. I started a FXCM account and got connected to skilled advisors. During this time, I saw the balance increasing. This increased my confidence and I believed that the creators of the software were correct. One problem that I found this time was when I restarted MetaTrader, the skilled advisor fails to start it in a correct manner. You would feel as if it was working, but in logs of MetaTrader, it would be regarded as unregistered. The bestsolution was to remove EA’afrom specific charts and apply them again and they would again come back in a correct manner. The similar issue with an infrequency of deals again took place. There are times when I do not note the trading system for many days. During this time, there was an important loss and other losses were regarded to be small. The most significant thing to note down is that demo balance was huge for FXCM account. During this time, the initial balance was nearly ten thousand dollars and the finishing balance was about $9586. The size of lot was similar for both the tests. Finally, I feel natural regarding this item. I do not consider it in the form of big winner or loser. It completed mediocre over sixty testing days. Considering the cost tag of $969.95 I had high expectations. If you have an experience with this kind of trading system, you can post your own experience.